Cookies are not tricky so you may wonder what I could possibly say about making them that would help you? Well, actually if you are an avid baker, I probably have nothing on you. BUT if you are in the group of people who bakes a batch now and then and wonders why sometimes they come out great and other times they spread out like pancakes, and why sometimes they are a little tough but other times they are perfectly soft and chewy, well then you have come to the right post my friends. Here are my own Geni’s Ten Commandments of Baking…with cookies in mind but will really help with almost all baking. Fine print: Specific recipe instructions and grandma’s advice always trump anything here. 1) Thou shall only use UNSALTED real butter. Salt is an ingredient. Too much and your batter is too salty, too little and all of the flavors aren’t being amped up enough. So add in the amount of salt called for and don’t make it a guessing game by trying to figure out how much salt is already in your butter. Anything other than real butter is fake and au natural is always healthier and makes a better tasting cookie. When using margarine or shortening if the recipe calls for butter, your cookie texture will be different that originally intended and shortening does not add any rich buttery flavor to your cookie either. Although, SOME recipes call for shortening and then you must use shortening because the texture requires shortening. 2) Thou shalt NEVER melt your butter to a liquid state or even to a mushy state (unless the recipe calls for melted butter). This will kill your batter like no body’s business. 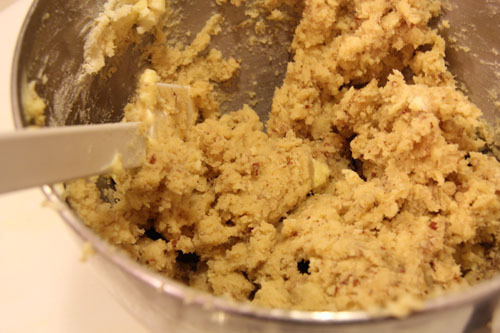 As fat melts, it releases air and moisture that has been trapped during the mixing stage, contributing to the rise of a cookie dough. If you let your butter melt when adding it to your mixture, your batter will be runnier and your cookies will spread out too much. HOWEVER, many chewy cookies do call for melting the butter; In this case it is fine, because they ‘ve accounted for the spread factor by adding other ingredients that will counter act it. —-*If you forgot to leave out your butter for an hour before making your recipe, you have my permission to put your butter in a microwave safe dish (not plastic please…let’s make this chemical free butter) and stick it in the microwave for 10-14 seconds depending on your microwave. Mine happens to be 12 seconds. Best bet is to do 10 and touch the butter with your finger. If you can leave a fingerprint and its barely soft to the touch, it’s good and done. If it’s not, put it in for another few seconds…just a few! BTW…Never soften butter for pie dough. The colder the butter, the flakier the crust. 3)Thou shall ALWAYS preheat the oven for at least 15 minutes. In a preheated oven, the released moisture turns into steam. Steam and air expand as the internal temperature of cookie dough or batter increases. This pushes on the walls of surrounding air cells, increasing both size and volume of cookies. Don’t fall for the propaganda out there (yes there actually is propaganda on this subject) about saving energy and skipping the preheating stage. That advice is just as forthright as convincing you to buy ocean view property in Wyoming. 4)Thou shall take the cookies out of the oven BEFORE they look completely done UNLESS you like crispy cookies. My dad likes his chocolate chip cookies good and crisp, so Mom this does not apply to you. Those of you who prefer soft and chewy cookies need to take them out when the cookies are “almost” firm to the touch but are still mostly soft and have “set up”. While sitting on the cookie sheet, they will continue to bake outside the oven until the internal part of the cookie reaches room temperature. This is called the residual baking. 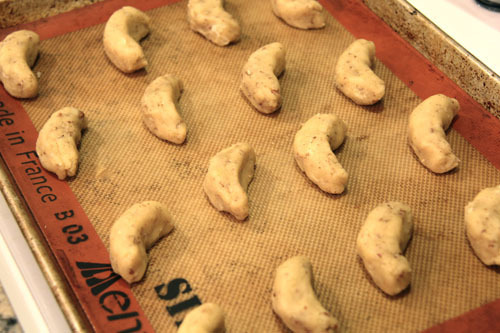 During the cooling period, proteins and starch bond and solidify, making cookies firmer and more rigid. Let the cookies sit on the hot cookie sheet for five minutes for this process to happen and then carefully lift them off with a spatula to let them cool on a plate or cooling rack. 5) Thou shalt not over mix the batter. This absolutely applies to cookies but also especially to pancakes. Creaming the butter with the sugar is perfectly OK and beating it together will allow more air to be worked into your mixture. Air is good. More air, means a better texture and more fluffy. BUT once you mix the DRY INGREDIENTS into the butter mixture or wet ingredients, gluten starts to form and mixing too much now will toughen up your cookie. Who likes a tough cookie? 6) Thou shall always scoop cookie dough onto a COOL COOKIE SHEET. If you take your cookie sheet out of the oven and are now ready for batch two, you cannot just go ahead and scoop away. Your cookies will begin to spread out too quickly and the dough will NOT hold its shape as well. Either have two cookie sheets going, one that’s cool and one that is just coming out of the oven, or simply let your cookie sheet totally cool off…like 10 minutes should be sufficient but honestly having two cookie sheets is the best plan of attack. 7.) Thou shall not grease my cookie sheet NOR place aluminum foil on it UNLESS called for in the recipe. Cookies have tons of butter, right? Then they will not stick to the pan and greasing it will make the bottom burn and will cause them to spread out way too much. Aluminum foil will also cause them to spread out a bit more, brown more on the bottom and will cause them to be a bit crisper. If you like all those things, which many do, then in that case foil is A-OK. It does make clean-up easier, however truly parchment is a better option for baking instead. Parchment does not interfere with the cooking and almost nothing sticks to parchment. Parchment will absolutely make your life easier when making numerous batches of cookies because you can just throw away the mess and get going on the next batch. 8. )I like to call this one, “Are you hot or not?” Thou shall get a cheap oven thermometer and test the temperature of the oven. This way you know if you are really baking at 350 like you think you are. Also…if you are using a convection oven (with the convection on) then turn your oven down 25 degrees F below the recommended cooking temperature. The convection causes the temperature to raise a bit and cooking time, even after lowering the temperature, will usually be decreased by a few minutes. The best way to determine cooking time is to check on your cookies five minutes earlier than the recipe calls for and look for goldenness, edges to turn a bit darker than the middle and for the cookies to look a little firm and then finally give it the touch test. 9. )Thou shall only bake one cookie sheet in the middle rack of the oven at a time. Yes, it’s faster to put them both in and yes it can be done…see my tips later. BUT if you want perfect cookies, they should be baked one sheet only on the middle rack. If you place a sheet below, the one below will ALWAYS cook faster and tend to be darker. To avoid this and still bake two sheets at once, switch the top and bottom one about half-way into the baking time. This will work but isn’t the best way. But let’s face it, time is of the essence in our fast paced lives. I am fully aware of that. 10)Thou shall never bake when mad, tipsy or in such a terrible hurry that the whole thing will literally blow up in your face. Baking under the influence of any of the above will likely end in less than happy results so why bother? So many times I have baked when I shouldn’t have and it never ends well. Usually for me, it’s when I’m in a HUGE hurry and if that’s the case, go to the bakery my friends. You will be so much happier. Your kitchen will still be clean and the item you are bringing will not be missing sugar or some other essential ingredient and even though it is not homemade, it will be edible. Edible is always good. To make the cookies: Preheat your oven to 350 degrees Fahrenheit. In a food processor, pulverize 1/2 c. of pecans. In the bowl of a stand mixer, cream together butter and sugar and beat for about a minute on medium speed. Add egg YOLKS one at a time,beating in between each egg. Add vanilla and combine on low. Mix your flour and salt together in a separate bowl with a wire whisk. Add the flour mixture to the butter mixture 1/2 at a time and beating on LOW in between. Scrape down the sides of the bowl. Add the pecans and mix on low until just combined. This batter is a little on the dry side…a little crumbly. That’s ok and is exactly how you WANT it. Don’t add more butter. You need them to hold their shape in the oven. To form the crescents. Get a small spoon and scoop out about 1-2 Tablespoons of batter. Form it into a ball and place the small ball in the “c” or crook of your hand (between thumb and index finger). Gently, press it into the crook and form the crescent. As you put the crescent down onto the cookie sheet, straighten it out a little if its crooked. Bake for 15 minutes, until golden and a little firm. These look great! I posted a recipe for Salted Caramel and Pecan Chocolate cookies on my blog today and nervously just read through your list- relieved I didn’t break any of your commandments!! I’ve been baking for years and have learned some new things reading your post. Thank you!! Great tips. Our grocery almost ran out of unsalted butter before Thanksgiving. Boy that would have been awful! The earth would have stopped. I’m sure. Thank you for sharing all the cookie tips, Geni. Those crescents look so delectable and X’masy! Your 10 commandments are spot on! And the cookies look delicious–I can’t wait to try the recipe. Great tips…and those cookies sound divine! Geni! Is that 400g of butter for those cookies? Have I told you lately that I love you……? I love your commandments!! And any cookie that fails is definitely due to not following those steps! Though, darn, I was planning on having some eggnog spiked with amaretto while I baked….adding a bit of good cheer to the day!! This year my daughter wants to bake with me – took me totally by surprise as she never wanted to do that before, not even the sprinkles!! She comes home Friday and Saturday we will bake. I decided to let go of my insane perfectionism and let it just be fun! 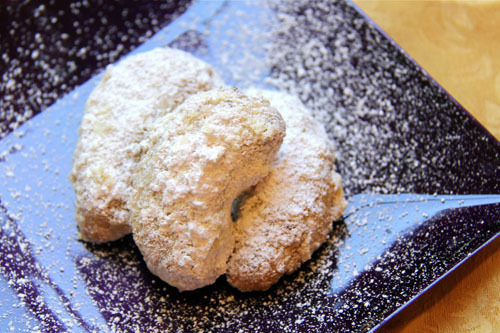 We will add these cookies to the list as I love the butter soft texture!! Happy Baking Geni! Absolutely love your cookie baking tips!!!! I’ve been guilty of breaking a few of those rules here and there. Fortunately I seem to have figured it out and got into a groove. 🙂 Happy holidays Geni! I hope you have a fabulous holiday and a great New Year! Cheers! These look great! Any advice/feedback for a new blog??? Always funny…I absolutely love “Geni’s Ten Commandments of Baking”. 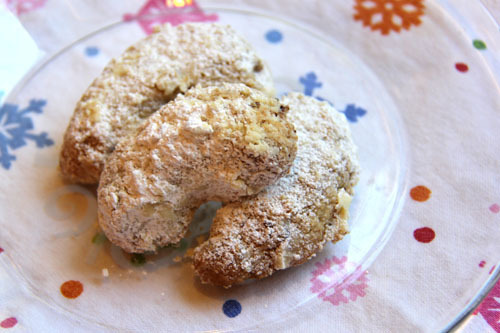 These cookies sound and look delicious, love the pecan in it and melting…yum! Katina was a friend of your great grandfather, on your dad’s mother’s side. They were both Greek. Katina had a bakery in a store called Famous and Barr.